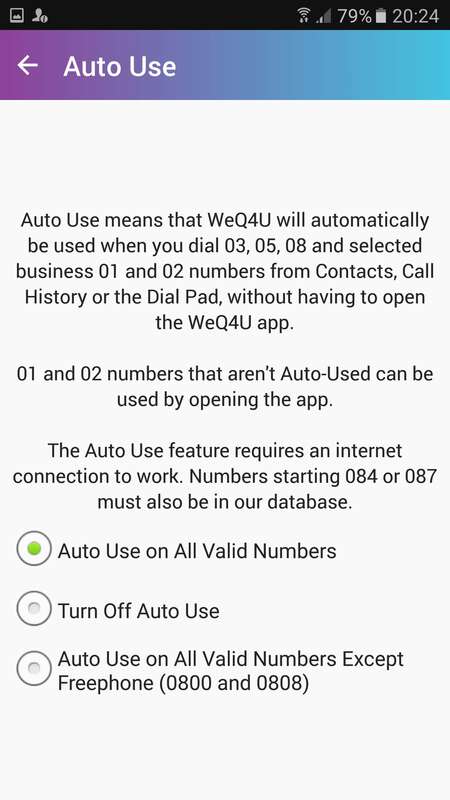 WeQ4U is a FREE Android/iPhone App and Service that puts you through to UK 01,02,03 and 08 numbers for FREE, without queueing. Mobile users save approx. 45p per minute on their 084 and 087 calls with WeQ4U, whether they encounter a queue or not, so it saves you money and time. 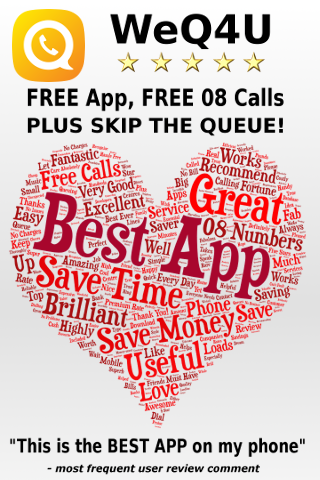 FREE app, FREE 08 calls! We believe people deserve a life free from suffering, and everyone's time is valuable. To help, we provide solutions that remove the pain from running, and getting through to call centres, even when things get busy. WeQ4U is our award winning, patent pending consumer telephone service that works with ANY UK number starting 01, 02, 03, 0800, 0808 or 0500. For other 08 calls, our extensive database of UK companies and alternate numbers covers MOST 087 and 084 numbers. It works with any phone. Try it now on 0333 5432111. To use it, just call us and enter the number of the call centre you wish to reach. We'll dial for you, and connect you to the call centre. 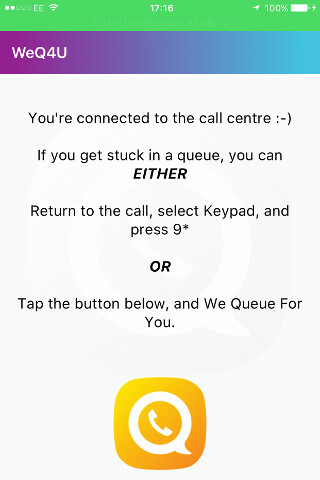 Once you're in a queue for an agent, just press 9* to disconnect your phone from the call - that's 9* to wait off hold. Then we'll reconnect you automatically the moment the agent answers. We'll stay in the queue for you, and once we've found you an agent, your phone will ring twice. As soon as it's stopped ringing, just hit Last Number Redial on your phone, or dial us on 0333 5432111, and we'll connect you to the agent straight away. Because your phone calls WeQ4U on an 03 number, all WeQ4U calls are included in your standard national minutes (whether you get stuck in a queue or not), so you don't pay high 08 rates, even when using the service on 08 numbers. Furthermore, with WeQ4U you only pay for the time you spend on the phone - not for the time waiting in the queue, so you can save £££s by using the service frequently. Q. How does it reduce my mobile phone bill? When you call an 084 or 087 number direct (i.e. without using WeQ4U), the amount you are charged is a sum of two parts, a Service Charge and an Access Charge. The Service Charge is up to 7p per minute for 084 numbers, and up to 13p per minute for 087 numbers. It is set by the company you are calling, and most companies that offer these numbers charge the full amount. In addition to the Service Charge, your phone provider will add an Access Charge. This varies by provider, but you can expect to pay between 20p and 45p per minute calling from mobiles, and between 5p and 10p per minute from landlines. So, unless you use WeQ4U, you can pay up to 58p per minute to call 084 and 087 numbers. We think mobile callers that don't use WeQ4U are paying around 45p per minute, on average. You avoid these charges by using WeQ4U, because all WeQ4U calls are to an 03 number, which means they are part of your monthly minutes allowance (and therefore FREE), just like 01 or 02 numbers. That's by law. So, you will save the most money (as well as time!) if you use WeQ4U every time you need to call a call centre using your mobile phone. We have handy Apps available for iPhone and Android, but if you don't have these, then call 0333 5432 111 from any phone to use the service. Your Best Bet: Download the WeQ4U App now, and use it for every call centre call. Q. What about land lines? For BT Landlines, 0800, 0500, 01, 02 and 03 numbers are normally included in your call plan. 087 numbers have a Service Charge of up to 13p per minute, and most companies that have these numbers charge the full amount. 084 numbers have a Service Charge of up to 7p per minute, and most companies that have these numbers charge the full amount. In addition to the Service Charge, your phone provider will also charge you an Access Charge for calls to 084 and 087 numbers. This varies widely - we've seen anything between 5p and 10p per minute on landlines and 20p to 45p per minute on mobile phones. Don't forget: You can also use WeQ4U on 01, 02, 03 and 0800 numbers to avoid the queues, and these calls are effectively free for you so long as you are on contract and stay within your monthly minutes allowance. Q. Are WeQ4U calls really free? 'Free' assumes you receive inclusive minutes to UK landlines as part of your mobile phone contract, or landline package. WeQ4U access numbers start with 03 and are included in these free minutes by law, but may be charged at your provider's normal UK landline rate if you go over your included minutes, just like any other 01, 02 or 03 call. So that's a yes then. Q. What about Pay As You Go? If you pay for all your calls by the minute, then the WeQ4U calls will be charged at the same rate as your regular landline calls (i.e. 01/02/03 rate), even when you're trying to reach 084 and 087 numbers. Using the service means you avoid the higher charges mobile companies apply when dialling 084 or 087 numbers, and of course you won't incur any call charges while we wait in the queue for you, so you'll still save money, even on PAYG. You can also use WeQ4U to avoid queues on 080 (Freephone) numbers, but please be aware that it is cheaper for PAYG users to call 080 numbers direct, as calls to 080 numbers are now free from mobile phones as well as landlines. Q. Does it work with every 08 number? The WeQ4U App and Service works with EVERY 0800 and 0808. For other 08 numbers, we will use an alternate number to route your call. Alternate numbers are sourced from publicly available sources. We cannot accept responsibility for the accuracy or quality of any alternative numbers used by the app/service, as we can't manually check every one. Use of WeQ4U is therefore entirely at your own risk. You can check to see if the service works with a specific number on the search page, or just use the App. Overall, we are able to successfully route 70% of calls to numbers for which an alternate is needed, so your odds of success are pretty good, particularly if you are calling a large company. Furthermore, unlike other alternate number sources, we do have some automatic checks in place to help clean our alternate number database, so your chances of finding a duff number with WeQ4U are pretty small. However, if you do come across a duff number, then please let us know straight away so we can fix it for next time for you. Q. Does it record my calls? No, we don't record any callers. We just deliver them straight to the call centre. Q. Will it share my personal details? We'd love to hear from you. Please see the WeQ4U 4 Business site for ways we can help you answer ALL of your callers without waiting - for FREE! - and also our database addition procedure. Q. How can you afford to run this service for free? In addition to the WeQ4U App, we have a solution for Call Centres called WeQ4U 4 Business, that helps all callers get through without waiting, whether they have the App or not. When you use WeQ4U to skip a call centre queue, we find out which call centres have long queues, so we can help them with our business solution. So, pressing 9* when you hit the queue helps keep the service free. Q. Can I use WeQ4U outside the UK? The WeQ4U app can only be downloaded from the UK versions of Google Play and App Store. 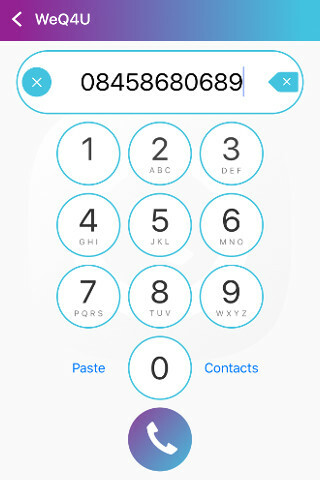 It only connects people to numbers in the UK. If you have already installed the app and travel abroad, then you may still be able to use the app to reach UK numbers. Please be aware that ALL calls through WeQ4U are made through UK 03 numbers. While in the UK, these are included in your standard contract 01/02/03 minutes allowance, by law. When you travel abroad these calls may become chargeable. It is likely that calling 084 and 087 numbers through WeQ4U will result in you being charged less than if you had called the 084 and 087 numbers directly, and we do have reports of people successfully saving money in this way when calling the UK from abroad. HOWEVER we strongly recommend checking with your mobile provider on rates to call UK 03 numbers when travelling abroad before attempting to use WeQ4U while travelling. You should definitely NOT expect WeQ4U calls to be free while travelling abroad. We therefore cannot accept any liability or responsibility for charges made by your mobile provider when using WeQ4U abroad. WeQ4U was founded by privacy campaigners and we take your privacy very seriously! Here are some notes about how we do, and do not use your data. The company that handles your calls is registered as a Data Processor with the Office of the Data Commissioner, and fully complies with the Data Protection Act. WeQ4U will not pass on any Personally Identifying Information to any other company or organisation. When you make a call with WeQ4U, we normally receive your CallerID as part of that call. This may be checked against the phone number stored on your phone by your mobile provider to ensure that the call has come from your phone. The only time we pass your CallerID on to any other party is when WeQ4U is being used, in which case it is sent to the Call Centre as CallerID, just like a normal call. We do make use of data about your call - specifically about particularly long waits - in order to approach call centres that may need our business solution. We may pass this information on to other businesses, such as our partners and resellers - but never information that would allow them to identify your specific call, and never your phone number. We may from time to time make use of aggregate call data in order to produce statistics on call centre performance, or league tables of poorly performing call centres, for example. We will never publish information about your specific calls. The WeQ4U app does NOT access any information on your phone for any purpose other than the delivery of our service to you. We're on the level! We do not record any portion of your call. That's all we can think of! If you have any further questions about privacy, or how we make use of data generated by the use of our service, please ask us by writing to Customer Services. Q. So what's the catch? WeQ4U is looking for bright, friendly and enthusiastic 1st line support engineer to provide technical support for our app and call centre customers. We want to hear from candidates with a can-do attitude who are also fast learners wishing to gain experience in the wide range of technologies. Initially the role will focus on providing 1st line email and telephone technical support to our customers as well as documentation but we will expect you down the line to contribute to new product development, customisation and upgrades. Manage / Update / Maintain WeQ4U Database. Monitor our bespoke warning system and report to 2nd/3rd line support if any issue arise. Reproduce and investigate issues reported by customers. Provide assistance with software deployment and software updates/upgrades. Liaise with 2nd and 3rd line support staff. Liaise with our suppliers whenever necessary. Create new knowledge based articles for reuse throughout the Support Department. Self-motivated, and flexible enough to help wherever necessary. We are looking for someone who is genuinely keen on learning new technologies, likes to face challenges and is a fast learner. Excellent written and oral English is a must. The the WeQ4U app and service is one of the highest rated and fastest growing apps in the UK. We are a small yet highly profitable company with a start-up ethos. Those looking for 'big corporate' need not apply. We make thousands of people happy every day. Come and help us. Good luck! 0800 to become FREE from Mobile Phones in June 2015! There are also going to be changes to the 084 and 087 number ranges that could mean that calls to these number ranges might actually go up, depending on your provider and the number concerned. We're still waiting to see details of these. 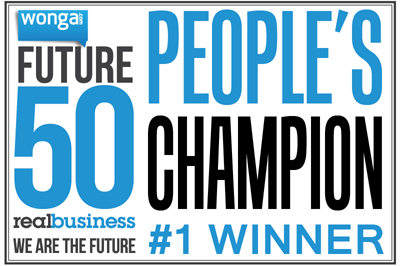 NEWS: WeQ4U WINS Prestigious Future 50 People's Champion Award! NEWS: WeQ4U pays the Dragons a call! Entrepreneur Matt King, who has invented a revolutionary new system to eliminate annoying call centre queues, is pitching his invention on the BBC TV show Dragon's Den on October 21. Matt is the brains behind WEQ4U, a smart free app which saves people from being held in annoying queues at call centres. Since its launch earlier this year, the app has been downloaded more than 10,000 times, saving every single user, on average, a hefty £76 pounds per year. The smart time and money saving service works with any phone and is available via iTunes and Android for mobile phone users, connecting them to hundreds of thousands of 08 numbers for free, saving them 30p per minute on their 08 calls. Under BBC TV publicity guidelines, Matt is unable to talk about his experience in the Dragon's Den until after the show is broadcast at 9pm on BBC-2 on October 21. "I can't give any details about my appearance, but I can say that if my memory of the filming is anything to go by, then it promises to be unmissable, says Matt. "So, to find out how the Dragons answered my call, you'll just have to tune in and see." Being held in a phone queue is one of the nation's biggest gripes, which is why Matt has developed a clever queuing robot that does all the waiting for you. The phone remains the most popular channel of communication for inbound and outbound contact (Infinity CCS 2012 survey), with 70 per cent of people preferring to make contact using their phone as opposed to email, text or social media. The average UK consumer however spends 45 hours a year waiting on the phone (source: Co-op). And 60% of customers say they find it difficult to get through to call centres (source: Future Foundation). A free app which saves people from being held in annoying queues at call centres, has been downloaded 10,000 times, saving every single user, on average, a hefty £76 pounds per year. Entrepreneur and innovator Matt King, who launched the new WeQ4U app in March, says mobile users are flocking to download the time saving app because of its 30p per minute savings. "The phone is still the most popular channel of communication for people wanting to make contact with a customer advisor in the UK, but lengthy call centre wait times remain a huge problem and customers are paying heavily for the privilege to queue," says Matt. Until call centre operators get their acts together, using the WeQ4U app is really people's only option if they want to save themselves time and a considerable amount of money too. His smart time and money saving device works with any phone and is available via ITunes and Android for mobile phone users, connecting them to hundreds of thousands of 08 numbers for free. WeQ4U is incredibly simple to use and works with any UK number starting 01, 02, 0800, 0870 or 0500, as well as many thousands of other 087, 084 and 03 numbers in WeQ4U's extensive database of UK companies, including Sky, British Gas, HMRC, Barclays, BT and The Post Office. WeQ4U app users access the service on money-saving 01 numbers, meaning they get WeQ4U calls included in their regular minutes, saving mobile users approximately 30p per minute when compared with the cost of calling 084 and 087 numbers directly. And if users get stuck in a queue, they just press 9* and their place is held for them free of charge until an agent answers, without using up any minutes at all. The average saving is £2.53 for every call made from a mobile phone. Calls are to standard geographic 01 numbers, and are included in callers' inclusive minutes, so there are no expensive 08 charges with the service. Naturally, callers pay nothing for the time WeQ4U waits in the queue. To use it via a landline, dial 0333 5432 111 and enter the number of the call centre you need to reach. WeQ4U dials it and connect callers to the call centre. Once in a queue for an agent, just press 9* to disconnect from the call. The system remains in the queue until an agent answers, when the user's phone rings twice. As soon as it's stopped ringing, hit Last Number Redial or dial 0333 5432 111 to be put through to the agent immediately. A brilliant new invention from a British entrepreneur is set to solve one of the nation.s biggest gripes - being held in a phone queue. 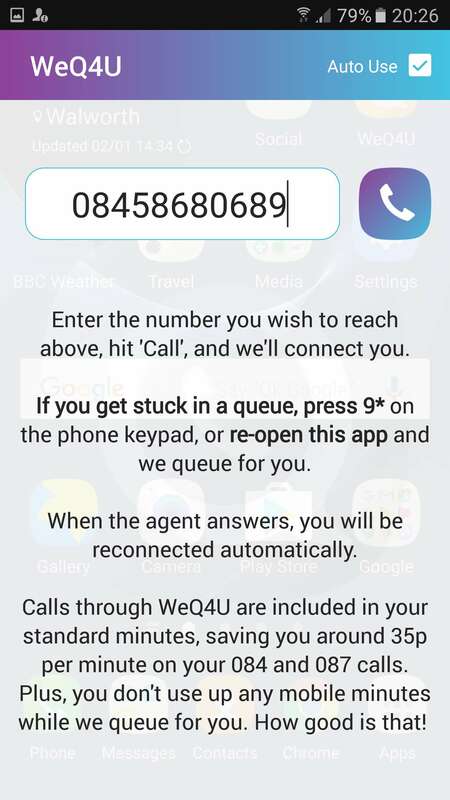 The new WeQ4U service is set to save frustrated callers millions of minutes a year being held in customer service queues as they try to get through to the UK call centres run by hundreds of British service industries. Software design expert Matt King has developed a clever queuing robot that does all the waiting for you. The smart time and money saving device works with any phone and is now available as a handy app via ITunes and Android for mobile phone users. WeQ4U app users access the service on money-saving 01 numbers, meaning they get WeQ4U calls included in their regular minutes, saving them about 30p per minute. And if users get stuck in a queue, they just press 9* and their place is held for them free of charge. The average saving is £2.53 for every call made from a mobile phone. "One of people's pet hates is being held in a queue when they are trying to get through to a real person at a call centre," says Matt. In fact there's nothing worse than being told that your call is important and will be answered shortly when it clearly isn't. "Research shows that people can be left on hold for anything up to an hour as they try to get through to a customer advisor. We are on a mission to put an end to that misery by connecting people to pretty much any UK call centre without them getting stuck in the inevitable queue." 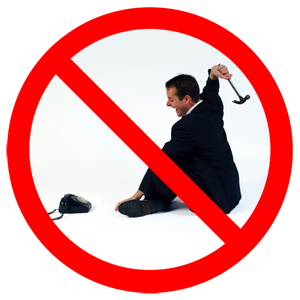 The average UK consumer spends 45 hours a year waiting on the phone (source: NOP). And 60% of customers says they find it difficult to get through to call centres (source: Future Foundation). WeQ4U is incredibly simple to use and works with any UK number starting 01, 02, 0800, 0870 or 0500, as well as many other 087, 084 and 03 numbers in WeQ4U's extensive database of UK companies. To use it via a landline, dial 0333 5432 111 and enter the number of the call centre you need to reach. WeQ4U dials it and connect callers to the call centre. Once in a queue for an agent, just press 9* to disconnect from the call. The system remains in the queue until an agent answers, when the user.s phone rings twice. As soon as it's stopped ringing, hit Last Number Redial or dial 0333 5432 111 to be put through to the agent immediately. With the App it's even simpler. Just press 9* to wait off hold and disconnect the call, and the system will reconnect you automatically when the agent answers. Calls are to standard geographic 01 numbers, and are included in callers. inclusive minutes, so there are no expensive 08 charges with the service. Naturally, callers pay nothing for the time WeQ4U waits in the queue. WeQ4U works with ALL 01, 02, 03, 0800, 0808 and 05 numbers, and MOST 084 and 087 numbers. To find out whether we work with a specific number, just open the App, or use the form below. You can check to see if a number is in our database by entering it into this form. Numbers should be 10 or 11 digits long, starting with 01,02,03,05 or 08. If you are a Call Centre Manager and your number is not in our database, please contact WeQ4U Support and we'll be happy to add it for you, and help your customers reach you more easily. Companies using our unique solution typically enjoy a reduction in abandonment of 90%, without the need to hire additional staff - so we can save you many thousands of pounds, while eliminating complaints about queues. Our solution deploys at the network level, so there's no hardware to install or complex integration - we could have you up and running in as little as half an hour. Join brands such as Bensons For Beds and River Island in finding out what a massive difference running an optimised queue can make for your call centre and callers. Best of all, it's FREE for UK Call Centres! We're ever so grateful for the tens of thousands of five star reviews WeQ4U has received from happy members of the public - we read every one. WeQ4U enjoys a 4.9 out of 5 star rating on both Google Play and App Store. Here are some of the many wonderful comments we've received from our users. Thanks everyone! "If Greek Gods made apps this would be it. This app has been forged in Olympus by the lightning bolt of Zeus, the code was written by Poseidon's trident and was safely carried down to earth by Oden's raven. No more queue music and it saves you a fortune. Highly recommend it. 👍 download it now 👌"
"Well done guys! Your are geniuses!!! Keep up the great work!!! 5 stars isn't enough your app deserves 110 stars! 😎😎"
"Excellent App - a must have for everyone. Last month my phone bill was £10 more because of 08 numbers - with this my phone bill is normal. Works brilliantly and you don't have to wait in a queue which is great. Used it several times now and it's excellent. It saves so much money you can't go wrong!!" "The best thing ever invented 😊"
"Does exactly what it says on the tin. 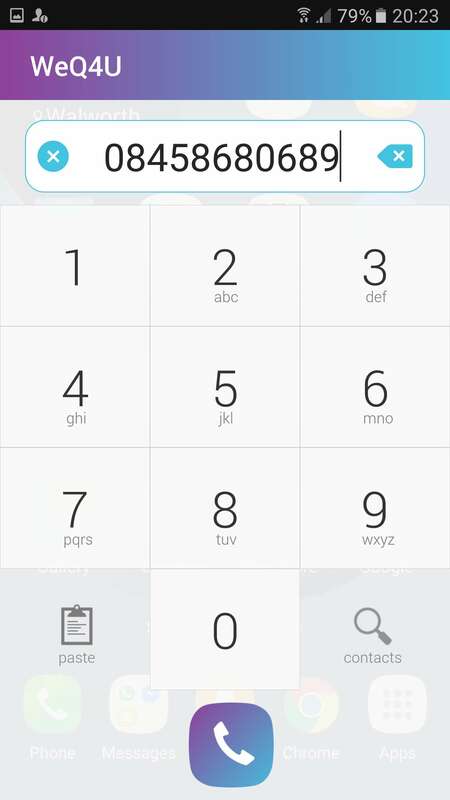 Connects you to most 08 numbers for free and even waits in the queue for you!" "Brilliant app - Saves time and money. Definitely recommend." Works perfectly. Saves time and money. What more can you ask for?" "Great. This app is amazing!" "Tried this and it worked brilliantly! I didn't have to listen to hold music and my phone alerted me and reconnected as soon as someone was available." "Amazing App I really hope this stays free, every 08 call has worked flawlessly so far, amazing!" "I've been waiting for something like this for a very long time. Customers shouldn't be subjected to these long waiting times and high call costs. Absolutely brilliant!!!" For general questions, bug reports or press inquires please fill out the form below. Thanks! We'll get back to you as soon as we see this. WeQ4U © 2017. All Rights Reserved.